I couldn't help myself. I offered a disclaimer in advance. It would be like if I ran into Jillian Michaels and felt compelled to fess up that I once stopped for longer than the permissible five seconds during the jumping lunge segment. Or, if one of my friends unexpectedly dropped by after my girls dismantled the family room couches and strung up their bedsheets from our ceiling fan with clothespins, it wouldn't be long before I found myself saying, "Sorry it's such a mess." So, in one of my early correspondences with Christiane Potts, known to most as The Mom Chef, I wrote something akin to this: "If you could see me in the kitchen sometimes, you'd pray for me." Her response? You goob. I already do pray for you. Yet another reason to like this woman. If you've read my blog for long, especially if you recall the Confessions of a Non-Foodie post from last fall, you'll know that I have a mixed reaction to food preparation. I'm absolutely intrigued by food, but I mostly fall into the category of people who cook because it's necessary to sustain life. While I'm not a bad cook by any means, I have been known to arrive at the dinner hour, look at the kitchen forlornly, and realize that it was time to scramble for a dinner plan, stat. This isn't the case for The Mom Chef, who falls into an entirely different category: a veritable food artist with some mad culinary skills. When I read her blog I'm propelled into a different world than the one which unfolds in my kitchen on a regular basis. She's graciously providing a guest post for today while I'm out celebrating my 10th anniversary with Joel, sans children. Enjoy her post today, and be sure to visit her fantastic blog to read even more: Taking on Magazines One Recipe at a Time. It's such a winner. Just like her. On July 25, 2011, I happy-danced. That was the day that Robin contacted me and asked if I would do a guest post for her. Guest posts, as a rule make me very, very nervous. My subject matter is pretty narrow and specific. You see, I can and do adapt, create, and throw together meals without recipes on a regular basis. However, I've use my blog to serve as an aid for those who, like me, might look at a recipe but not make it because of the factor of the unknown. Will that combination really taste good? With so many ingredients can I actually make this at home? Does it take hours? Are there hours of clean-up involved afterwards? That kind of unknown. Most food bloggers like to show their skills at adapting recipes or creating something new. I follow the directions exactly and then review what I find. But, when Robin wrote and asked if I'd post for her, I immediately said yes because I am in love with her family. I've never met them, but through reading about her three beautiful girls, I can relive where Dudette's been and get a glimpse of where my young lady is going. Her stories of family and motherhood make me smile on a regular basis. As soon as we agreed that I'd do a post, I went to my August magazines to find good recipes. I hang my head in shame at the options I presented this woman who: a) doesn't cook at an advanced level, and b) has three little girls. Five-Spice Chicken with Hoisin-Maple Glaze or Zucchini-Ricotta Fritters. What the heck was I thinking? Robin was so gracious. She chose the fritters without a word. Luckily, I came to my senses and changed the recipe, knowing my go-to magazine, Fine Cooking, would have a child-appropriate treat that I hope will have the girls doing as big a happy-dance as I did. I am not fond of giving Dudette a treat that is just frozen sugar water with artificial color and flavor in it. Not only is there the issue of what she's putting in her body, but a good portion of that sticky substance usually ends up on her clothes, the floor, and our furniture. Instead, I have taken to making my own popsicles. Many people have, as evidenced by an entire section dedicated to Ice Pops in this Fine Cooking issue. In fact, it's in the "Cooking Without a Recipe" section, which I adore. The link below will take you to the spot where you can put together your own combination, so I'll just walk you through what I did. I made my own Creamsicles, a ice cream truck favorite I loved as a kid (right up there with Push-Ups and Sky Blue popsicles). Part one is to pick the syrup, puree/juice and add-in by looking at every step before starting in. Next, make the syrup. I chose a vanilla simple syrup, half a vanilla bean, split and scraped to create the flavor. Next came the juice. I chose orange juice. Reese, Brooke and Kerrington; I squeezed all those oranges just so there would be fresh juice in the popsicles I'm making because you deserve something fun and sweet (instead of zucchini). Since I wanted the popsicles to be creamy (hence the Dreamsicle comparison), instead of using two cups of juice, I used one cup and then added a cup of vanilla yogurt. When the vanilla simple syrup was cool, I added it to the orange juice/yogurt mixture and was ready to pour. 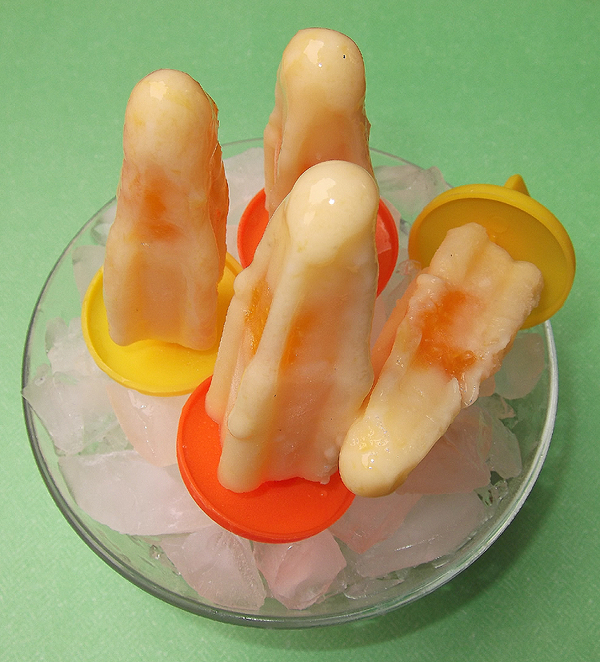 After putting slices of mandarin oranges in the popsicle molds, the juice went in and around the slices and, sticks were added, and the whole thing went in the freezer. It was fast, easy, and felt good to know I was making something healthy for Dudette and in honor of my three little friends. Is it bad to be happy that something was made in honor of three little girls when they're not actually around to eat the supply? Should I feel guilty about that? Wow, these are good. We're absolutely loving the popsicles and are ready to start another batch before these even have a chance to get eaten. Trying other varieties is a must as well. Strawberry-pineapple? Blackberry-orange? I'm going to be all over these things this summer. For this one, I might go with the whole vanilla bean. If you use plain yogurt, definitely do this so you get a good, strong vanilla flavor alongside the orange. Combine the sugar, salt and 1/2 cup water in a 2-quart saucepan over medium heat. Bring to a boil and make sure the sugar has dissolved; add the split vanilla bean. Reduce heat to medium low and simmer for 2 minutes. Remove from heat and let the syrup cool completely. Remove the vanilla bean halves. Squeeze 1 cup's worth of juice from the oranges. Whisk in 1 cup of Greek yogurt. Combine the 2 cups orange juice/yogurt combination with the reserved syrup. Distribute the Mandarin orange segments among ten 1/3-cup pop molds. Add the fruit mixture to each mold, leaving about 1/4 inch at the top to allow for expansion. Stir gently with a Popsicle stick to distribute the stir-ins. Freeze until partially frozen, about 1 hour. Insert sticks and freeze again until the pops are fully set, 4-6 hours more. To unmold, dip the mold in a deep pan of hot water until the pops pull out easy, 30-40 seconds, or let sit at room temperature for 5-10 minutes. Unmold and store the pops in individual resealable plastic bags. Best eaten within 3 weeks. Robin, it's so nice to meet you. The photo's of you and your girls are beautiful!! I relate completely about showing up in the kitchen at dinner time and then scrambling for a plan. I like to think it just keeps my creative juices flowing! :)....speaking of juices...MomChef's popsicles looked so wonderful, I just had to get over here to see the recipe. I love that combo of flavors! I'm sure, if she hadn't eaten them all herself, you and your girls would have loved them - LOL. I adore Christiane...I know God orchestrated these sweet friendships and I'm very grateful! I hope you and your husband enjoyed a beautfiful celebration...Happy Anniversary! Fine cooking has some awesome Popsicle recipes. Your pops look great. I know... the popsicles look AMAZING. The Mom Chef has outdone herself again. A Multi-Dimensional Life: Wow, thank you so much for the kind greeting and for hopping over to Pink Dryer Lint! I'm in agreement -- Christiane is wonderful. I look forward to visiting your blog!